Why is this photo upside down? The “mystery” woman of yesterday’s Channel 10 news at 6:00pm – Tuesday, Aug. 27 – has been identified. The woman who posted a picture of herself with Bob Filner’s arm around her shoulder. The woman that did not edit out the glass of beer in the Mayor’s hand. The woman that smiled into the lens of the camera as the snap took place. Who, you might ask, was the “mystery” woman? Do I know her? Have I ever met her before? Is she famous? Should I make an effort to get her signature? Might she run for Mayor of San Diego? Is it true that there were over 15 people trying to identify her for Channel 10? Would I have known how to find her if they had contacted me? How could one picture of a disgraced mayor with a smile on his face and a glass of beer in his hand generate so much interest? Was this “mystery” woman his new squeeze? Here he resigned only two days before and he is seen in what was described as a “compromising” situation. Who compromised whom? Come on people! Do you know who that mystery woman is? It’s me! The Widder Curry. I attended a meeting of the Pt. Loma Democratic and the Mayor was there. I asked to have a picture taken with him because – well – just because. I also was hugged by Rich Grosch – we had worked together on a project many years ago and hadn’t seen each other for years. Got a hug from Marty Block also. Only shook hands with Sarah Boot, but got a hug from two club members – John and Bob. What does that make me? I like hugs; I miss the deep hugs I received from my husband for 48 years; I accept a hug whenever I can get them. Does that make me a Teleiophile? Getting one from the Mayor of San Diego – he still is, you know – was a little bit of solace for both of us. But I am glad that the mystery has been solved. And I want to thank Vanessa and the photographer from Channel 10 news for making me feel comfortable enough that I could offer them a jar of my home-grown jam. Hey! You are the first one to even mention the word! Good for you. I’m impressed. Congrats to Ms. Curry. 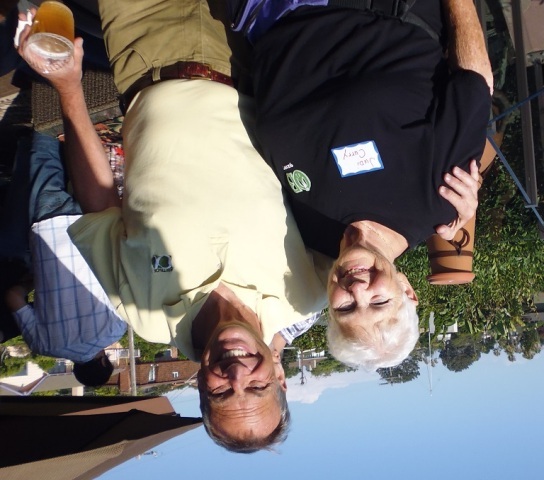 Surely, she is one of the FEW women photographed with Bob Filner lately that HASN’T yet pulled a “Gloria Allred” on the lame duck Mayor or cried out “SEXUALLY HARASSED!” Thank you to the OB Rag for proving that Bob Filner enjoys a good beer on occasion and likes to hang around with the ladies of the Point Loma Democratic Club! Thank you Gail. The OBRag tries to report objectively on all issues. You got it Dave. When and where? Ah….so nice to have something to look forward to!